In the course of creating these pages, we have received much correspondence. Occasionally, we receive a thoughtful piece of writing which doesn't quite belong on the park or club pages, but is highly informative and does deserve to be read. We'll add them here gradually for everyone to enjoy. You have made two false assumptions. The lesser is that a co-op club would necessarily have a social function. This gets confusing because the traditional distinction is between a stock club and a co-op club. "Stock club" refers to how the legal entity was organized, while "co-op club" refers to how player wages were determined, so combining the two is a category error. The original model of a baseball club was as a fraternal organization. Professionalism got grafted onto this, not entirely happily. Fraternal clubs fielding professional teams might pay the players salaries negotiated in advance, or operate them as co-ops, sharing gate receipts with the players. A stock club could in principle operate as a co-op, but I have never heard of this happening. The whole point of selling stock was to raise enough capital that they could pay salaries, and therefore get better players. As the professional era progressed you start to see co-op teams with little or no club backing them, since at that point the fraternal club takes on more the role of a booster club to the team: nice, but not necessary. The Atlantic clubs you see in the late 1870s and early 1880s were various efforts by Billy Barnie. He organized a low-level, effectively semi-professional co-op team in the late 1870s that didn't accomplish much. He spent some time playing in California, but came back when baseball revived in New York and organized the 1881 Atlantics that played in the Eastern Championship Association. That was the club that almost but not quite joined the AA. 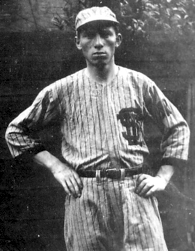 Barnie finally ended up in Baltimore, and the club that eventually became the Dodgers began play in 1883. I don't know the story behind the later Atlantic clubs, but strongly suspect they were amateur or semi-pro teams simply using the traditional name. Note: Our Dodger page originally referred to the 1953 team as "probably" the greatest Dodger club. Here, we were set straight. In regard to: "The 1953 squad went 105-49 and was probably the greatest team ever fielded by the Brooklyn club," I'd say: no probablies about it, because no previous team was so overwhelming and, not only was it greatest edition of the Dodgers, it was the greatest offensive aggregation in the NL after the longball decade of the '20s and the juiced-ball season of 1930. In that year, 6 of the 8 NL teams hit over .300 and the BA of the entire league was .303; meanwhile the Braves, with a measly .393 slugging average, were the only team below .400. Four teams scored more than 900 runs, the Cards leading the pack (good pun, eh wot?) with 1,004 runs, and the Cubs led the league in slugging with a .481 average. That age of bombast aside, the 1953 Brooks may claim superiority over teams in both leagues since 1920. In that year, they outscored their nearest competition, the Cards and Giants, both of which plated 768 runners -- 187 fewer than the Dodgers. The next largest distance is between the 1067 runs (the highest total ever) tallied by the Yanks and the 885 (182 fewer) scored by Cleveland in 1931. Perhaps still more remarkable is the Brooks superiority over the 1927 "Murderers Row" Yankees. That's the lineup that hit 158 homers, 36 percent of all in the AL (the other seven teams averaged 40 homers), while also leading the league in triples, batting average and slugging average. However, it outscored next best Detroit by 130 runs, 975 to 845. By percentages, the Dodgers outscored their closest competitors by 24.35 percent; the '31 Yanks theirs by 20.56; the '27 Yanks by 15.38. The Bums' .474 SA in '53 is also the highest in the NL over that span and was tops in the majors between the .483 of the '36 Yanks and the .484 of Cleveland in the strike-shortened 1994 season (if that counts -- I asked a fellow fan if it does; without hesitation he said it doesn't, and I'm inclined to agree). As a matter of fact, it is fifth all time in the majors (6th, if you do count the '94 Indians). A digression. My Shakespeare projects, especially the one on his English history plays, have affirmed, as one historian put it, "History makes its own ironies." Here's a beaut (as we old-time Brooklyn fellas would say). When the Yanks posted their .483 SA in '36, the 2nd place team was Cleveland with .461. When Cleveland had its .484 in '94, the 2nd place team was the Yanks with .462. Each pair of figures separated by 22 points. I wonder what the statistical odds of that are. Back to our story. You may want to get your hands on a book that will fill in the years from 1995 to date, just to see how our Bums hold up. You see, their margin in SA -- .474 to the Cards .424, 50 points more -- is second all-time to the '27 Yanks, which had a .489 SA against the A's .414, 75 points. If an AL team tops the Dodgers margin, I'll grumble but live with it. If it's an NL team, "I'll have such revenges on them that all the world shall -- I will do such things -- what they are, yet I know not, but they shall be the terrors of the earth!" (King Lear, act 2, scene 4, lines 274-78. Forgive me, Will.) I got it! I'll get baseball to pass a law that their uniforms will have to look like the Houston Astros' in the 1970s. It will make them look like oversized, bloated candy corn! Anyone who has a shred of dignity, an ounce of self-respect, would rather get duded up as Ronald McDonald. The '53 Yanks didn't come close to Brooks in hitting -- but the Achilles' Heel of the Dodgers was their pitching. The Yanks regularly led the AL in ERA and the '53 staff's 3.20 ERA was 90 points better than the Dodgers'. As a matter of fact, the Brooks outhit the Yanks and it showed up in their ERA, 4.50. But then, the Dodgers staff pitched to a 4.94, as they were outscored, 33-27. If the Bums won that Series that team might have been put right up there with the '27 Yanks. But, until your "probably," which sent me to my BB encyclopedias, I too did not recognize how far the '53 club's offense stood above all others for so many years. Memory plays tricks, and there are a few details in here that are a little off - Bedford Avenue had no trolley, but Nostrand and Franklin, each a block away, did. But this is a fantastic story. We have reproduced it with Peter Stern's kind permission. My grandfather was a baseball man. When I knew him, in his seventies, eighties and nineties, he had hands that were gnarled and twisted by arthritis, but he always said it was because he took too many foul-tips on his fingers when he was a catcher. Grandpa played baseball, watched baseball, followed baseball, analyzed baseball, taught baseball and talked baseball. He talked about other things too, of course. He talked about walking a mailman's route near Coney Island for 30 years and how friendly neighborhood dogs followed him like some kind of government-issue Pied Piper. He talked about how his best friends were gassed during World War I and came home, but were never the same again. He talked about how he worked in a thermometer factory but escaped before the chemicals could poison his nervous system as they had the old men who worked there, giving them the "mercury shakes." He talked about old-time Brooklyn and old-time baseball which, in his mind, was pretty much the same thing. You can't talk about Brooklyn and not talk about the Dodgers. "I saw Zack Wheat play at Ebbets Field the year it opened," Grandpa remembered. No one remembers Zack Wheat anymore. That was 1913. Grandpa went back year after year, until the old place closed. Like a great many men his age, who, later in life were scattered around the New York area, my grandfather believed that the three biggest villains of the 20th century were Hitler, Stalin and Walter O'Malley, the Dodgers' owner who took the team to Los Angeles in 1957. 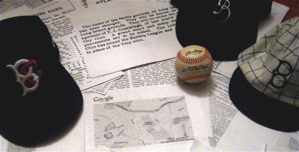 Of course, when he first saw the Dodgers play, in the years before Ebbets Field, they were not yet the Dodgers. They were the "Superbas" and before that, unfathomably, the "Bridegrooms." They did not take on their more familiar name until 1911. In those years, so many streetcar tracks cris-crossed Brooklyn that its citizens took their lives in their hands when crossing streets at intersections where as many as six lines converged. Some didn't make it. In the early 1900s, hundreds of pedestrians a year died in streetcar accidents. Hence, the residents of the borough were nicknamed "Trolley Dodgers," a name that the ball club shortened to "Dodgers." My grandfather was a baseball man, but his father was not. He was a teamster when that was a job description and not just the name of a union. He worked at Bossett's Lumber Yard in the Bushwick section of Brooklyn. Before there were fork-lifts, a stack of lumber moved from one end of the yard to another only if a gang of strong men loaded it onto a heavy wagon pulled by a team of enormous draft horses. My great-grandfather drove the team, a task that required physical strength which he had in no short supply. A short, barrel-chested German immigrant, he resembled nothing more than a beer keg with arms and legs. Grandpa often made it clear that his father was not hesitant about using his strength in any way he saw fit. At this point in any such story, Grandpa would point to his own head, indicating the places where his father's hair would not grow because of the scars acquired in the conflicts and confrontations of his youth in Bavaria. Grandpa liked to tell about returning by streetcar from a rare Sunday outing to Coney Island with his father, mother and two sisters. There were three young men - "punks," he called them - talking loudly and using language that offended the sensibilities of the day. Grandpa's father told them nicely that he didn't think that they should be using words like those in front of his wife and children and asked them to please quiet down. They ignored him. He told them, not so nicely, that they had better shut up or suffer the consequences. They still ignored him. He then threw - physically, bodily, literally, threw - first one, then another of the punks from the rear platform of the streetcar. The third left the car voluntarily. According to Grandpa, his father had but three things in his life: work, family and God. He worked from sun-up to sun-down six days a week, spent every evening with his family, and on Sundays he prayed. He had no time and little patience for frivolity like baseball. He did not care to watch his son play the game and, in fact, did only once. The ball fields of my grandfather's youth were hardly the manicured diamonds of major league baseball. Often, they were simply open lots large enough to lay out the base paths with some room left over for the outfield. To a field such as this, Grandpa persuaded his father to come one Sunday afternoon after the family had attended mass at St. Leonard's Church. Grandpa played left field that day in the uniform of the "St. Leonard's Juniors." At this particular lot, there were no walls or fences. Only a shallow ditch separated left field from Bedford Avenue, one of Brooklyn's main thoroughfares. It is the second inning and the inevitable happens.Thwack, the opposing team's beefy clean-up hitter launches a towering shot to left. Joe Soeder, left fielder, knows by the sound how far he will have to run. Back he goes, to the limit of the playing field, down one side of the ditch and up the other. Still further, he goes back and finally camps where he knows the ball will come down � directly between the rails of the trolley tracks in the center of the street. Clang, clang, from his left, a motorman rings out a warning. There is no choice, really. My grandfather is a baseball man. As he sights the ball through the thicket of overhead wires, brakes are applied fully, steel wheels screech along iron tracks. Sparks fly. Clang, clang, clang, the bell is more insistent now. Thwap. Horsehide ball settles into leather glove. Only then, did my grandfather take his eyes from the ball. He looked left to see the motorman's face, florid and breathing fire, inside the cab of the car where it had stopped, not more than ten feet from where Grandpa stood. Then he looked right, searching for a barrel-chested man along the sidelines and found him. The man with the stout build and patchy hair shook his head from side to side, turned and slowly walked away. Grandpa played on. Trolley Dodgers? Not my grandfather. He was a baseball man.